I love cycling. I am though, a mountain biker through and through. The road scene is just not that well known to me (save Le Tour), so when I suddenly had to interview notable road racers that I’d only just met, or heard of, I felt, well, ill prepared and I’m sure it was pretty obvious to them. Nevertheless, there I was standing next to reporters from the Journal, CTV, CBC and Sun with my little camera shooting away. This was a great experience though. The racers were more than accommodating and meeting racers like Women’s World Track Champion Tara Whitten, and Men’s National TT Champion Svein Tuft was something I won’t forget – getting to ask them questions and talk to them about what they love to do, perfect. These interviews can be seen on PedalMagazine.com here. Now I missed the TT races, but I got to catch both the women’s and men’s road race on the Sunday. This was the very first ‘real’ road race I’ve ever seen, live. All I can say is ‘WOW are they fast!’ You really have to be standing there next to the road as the whip past you, or on the top of a long hill like Victoria Park, to truly appreciate the speed, and seemingly, the ease with which these riders charge up hills. It was amazing to see, and hear the whole peleton, (men 150+ at its largest) role by. The sound of all those tires and carbon bikes was like nothing I’ve ever heard before. It’s funny, the race wasn’t even over yet, and I was texting Ken, suggesting Tour of California in 2011! 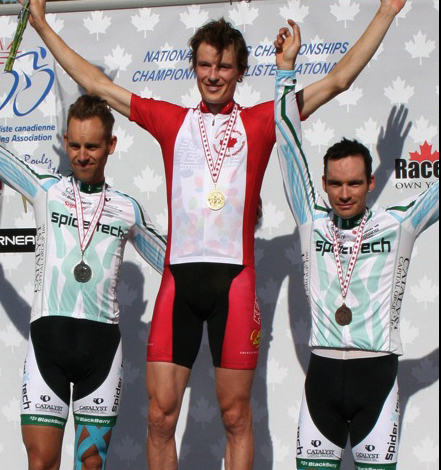 So, I have to admit, my crash course in road racing at this year’s Road Nationals, right here in Edmonton was great. I know I’ll be following the circuit more closely now. Congrats to our new Canadian Champions and to the organizers, including the ABA, CCA, City of Edmonton, City of Devon and Bonk Cardio Adventures to name a few, for a great weekend of world class road racing. Hi guys, I’d like to invite you to submit your blog to our World Cycling Blog directory. It is called Crank Listed and you can submit your blog at http://cranklisted.com. Hope to see you guys on there. Keep up the great blogging. Great work SS! Thanks for helping out on the weekend. A fine piece of reporting, Sheldon! good work sheldon. It was entertaining. Thanks, ya’ll! It was a blast!